I instantly fell in love with the book, Little Blue Truck when my son was born. The clever rhyming and fun storyline has kept this book at the front of our bookshelf for years. But, today, we’ve made it even more fun by adding a little blue truck sorting activity to the mix. Playing alongside this classic children’s book is not only a great way to extend learning, but also to incorporate a little math into your child’s play. 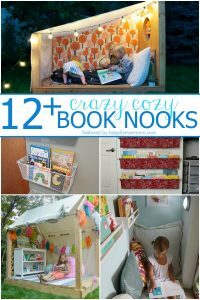 Thanks to Clarissa from Munchkins and Moms for contributing this great guest post for us today! Hello, Happily Ever Mom readers! 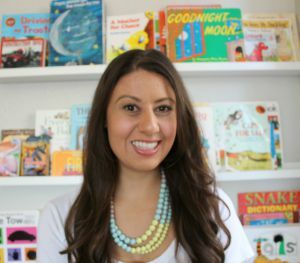 This is Clarissa, author of Munchkins and Moms, here to share a great preschool activity with you all! 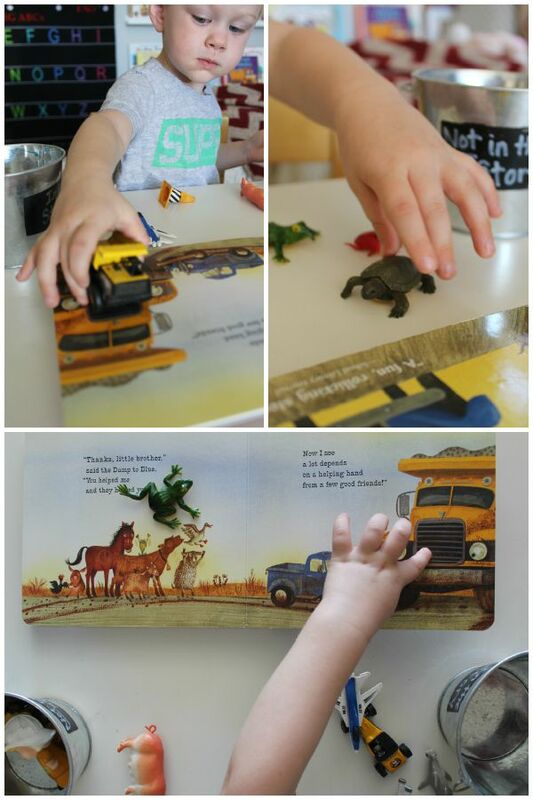 We just love to do activities based on books in our home preschool, and story sorting is one of my favorite ways to do that. The first story sorting activity we did was based on Goodnight Moon, which has been a popular activity with both my boys and my readers! 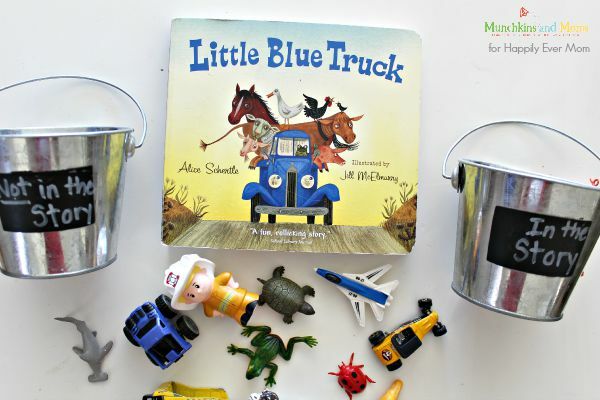 Today, I’ll be sharing how to use this same idea for another beloved preschool book, Little Blue Truck. 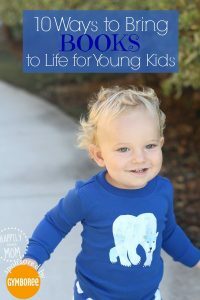 One of the things I like about this activity is it take very little preparation, and you likely already have all the supplies in your kids’ toy box! 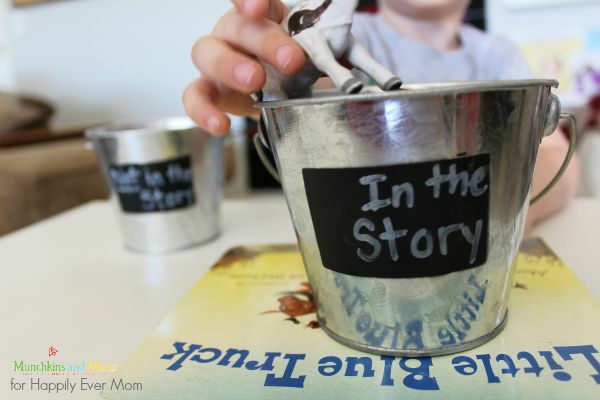 I used two tin pails labeled “In the story” and “Not in the story” (you can use baskets or even just labeled pieces of paper for this supply). 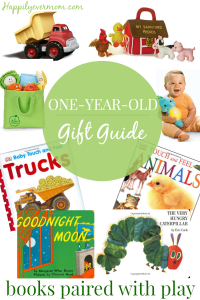 I rounded up toys that fit with the story (and a few that didn’t fit the story): a dump truck, little blue truck, various animals figurines, little people, etc. 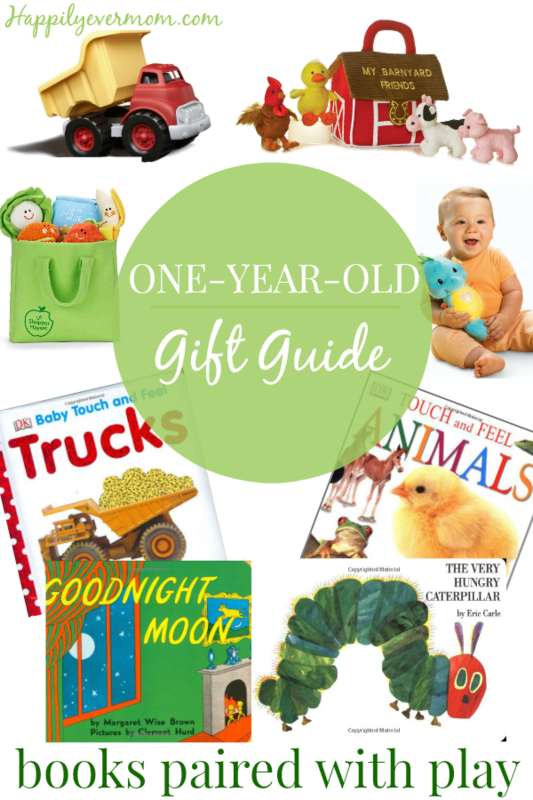 You can even get a plush little blue truck – too cute! For our first round of this activity, I sat with my two year old and we pointed out what each item in front of us was. Then, we opened the book to help sort the items. My son matched several of the items to the book, and together we put them into the “in the story” tin. Whatever was left over we put in the “not in the story” tin. While this activity may seem simple on the surface, there is so much going on here! 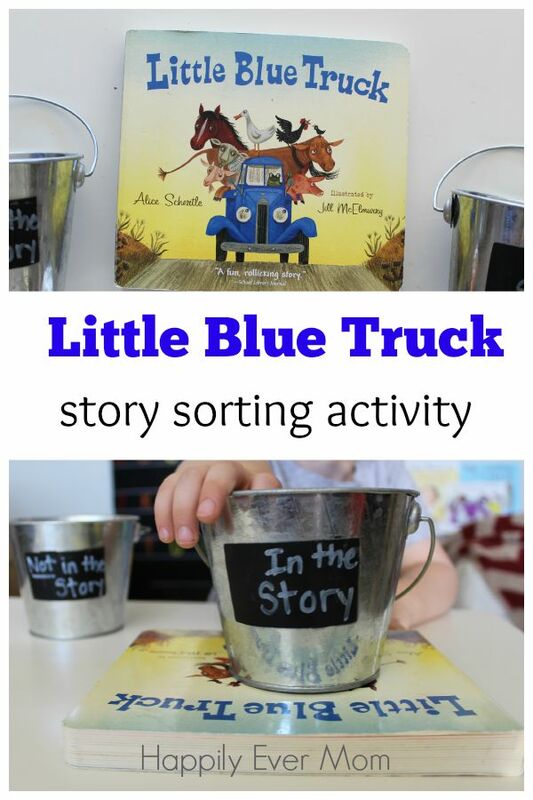 Sorting is a great early math skill, and connecting sorting to literature is a great way to practice early literacy skills such as [story] recall and reference! Since this is a new activity for my 2 year old, he needed my assistance with this sorting, while my 3 year old can do this pretty easily now. When my son was unsure about how to sort a toy, he knows to look through the book for reference – that’s an amazing skill to learn so young! If you have an older preschooler, you can use this activity to introduce a new book to him/her as well. Start by telling the child the title of the book and showing them the cover. Let them make predictions about which elements they think will be in the story based on what they infer from the cover and title (these are two more great literacy skill- making predictions and references!). Make sure to keep the book closed during the activity, then go back to check predictions after the first read trough. What’s most important is to have fun. There are so many ways to learn and to play! Do you think our preschoolers would enjoy this activity? Try it out and let us know what you think in the comments! Clarissa is a former teacher and the author of Munchkins and Moms, a blog about learning through play in the toddler and preschool years. She has a passion for children’s literature and loves teaching and learning right alongside her two boys! Follow Munchkins and Moms on social media to see what’s new!